Printers pull finished sheets, step 5 of the chromo-lithography technique. Waxman Collection of Victorian Trade Cards: Food and Domestic Life. Part of a set of six cards that demonstrate the color- or chromo-lithography technique, with each main scene in the card depicting a different stage in the process. 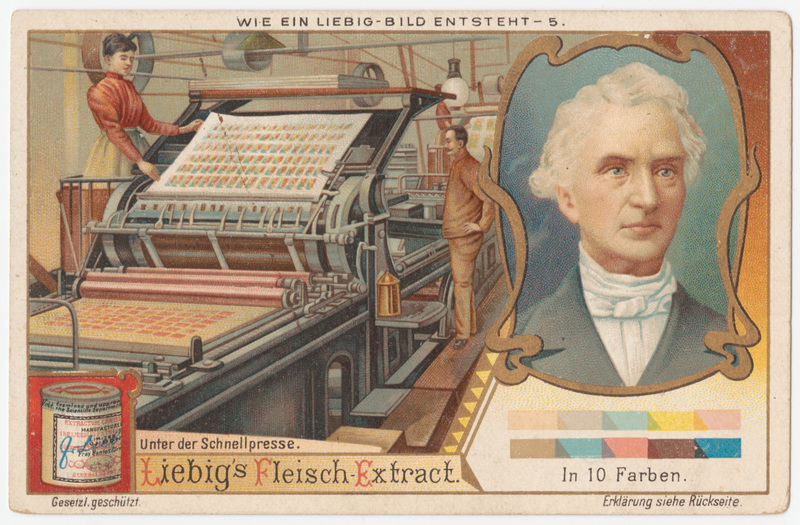 Each step adds two additional colors to this particular portrait of Justus von Liebig, whose Liebig Meat Extract business is being promoted in these cards. Waxman, Nahum Nahum (nach) Waxman Collection of Food and Culinary Trade Cards. Nahum (Nach) Waxman Collection of Food and Culinary Trade Cards, circa 1850-1900. Presumed to be in the public domain because of creation date. This is a growing collection of images from the Division of Rare and Manuscript Collections, Cornell University Library. Images are drawn from a variety of rare book collections, as well as the University Archives and other manuscript collections.